Words are a very powerful sales tool. Just as they can be very powerful and work for you, the opposite is also true. Your copywriting could be holding back your conversions. If you want to make the most effective page possible that converts the maximum amount of visitors, it must have solid copywriting. Here are 14 mistakes to avoid. If you want to write a solid page for conversions, you should have a good plan for how you’ll accomplish that. Having a great plan can make or break your landing page. If you’re just going to wing it, you can expect the results to be similar to the effort you put into planning it. Preparation is key in almost every aspect of business, and a landing page is no different. One of the easiest things to do when working on the copy for your landing page is to simply copy another page you like. This is a massive mistake. Just because someone else is running with that copy or style of a page doesn’t mean that they know what they’re doing. You don’t know what the stats look like, or the actual goal they’re trying to achieve. Start building from the ground up for best results. You get what you pay for. It’s a solid principal for just about anything, but especially true for copywriting. The best writers get paid the most for a reason. If you’re not going to spend the appropriate amount on a copywriter, then how important can it really be to you? If you want a solid job done, you need to pay a solid rate to a solid writer. How well do you know your audience? If you’re not using the language of your people, writing mistakes can actually make your audience uncomfortable. Uncomfortable people don’t stick around to convert. Know your audience, and speak to them in their language. This is where hiring a solid copywriter can help. You’ll find so many opinions on this topic that only one thing is for sure: There is no right or wrong answer – except what works for you. This is where your A/B testing is vital. Test long form copy alongside the short form to see what works better. Your instincts may be to write short copy, only to find out that the reader needs more information. The opposite is also true. Don’t write long copy when less will accomplish the job more efficiently. Testing is the only way to know what will work for you. Your call to action is the whole point of the page. What is yours? Try not to over-complicate things. Be direct, keep it simple, and try various words to get action. You’ll hear A/B testing a lot here – but this is why. “Learn More” vs. “Download the eBook” vs. “Check Out These Tips” can all have a major impact on conversions. Make the call to action obvious and well written. You don’t want people to miss it. This has been a no-no for a couple years now, but if you’re still writing pages for search engines, you won’t rank in search, and you won’t convert those that do find you. Keyword stuffing is unnatural. Write solid copy that sells, and the results will be there. If you’re having a hard time writing natural sounding copy, check out these reviews of websites that will help you find someone that can. These are a great way to lose people before you begin selling. If your first line is “Looking for a new router?” you’re going to lose all the people that say no right away. The truth is, you don’t care if they’re looking for a new router – the one you’re selling is better anyways. You just need to convince them of that. Sales copy isn’t as simple as yes/no. It’s about convincing people – not asking them if they already have the answer. The ones with the answer already don’t need to be converted. A feature is something the product has. A benefit is what that feature will do for the customer. If you’re writing about features, you’re doing it wrong. No one cares about the features – they want to know how it will benefit them. If you’re only writing about features, you’re leaving it up to the reader to consider how it might benefit them. That’s a big ask. Here’s a simple way to turn features into benefits. This is the overall question that is used in converting features to benefits, but should apply across the board in your site copy. Explaining the why is vital to conversions. Why does this product exist? Why does it make the users life better? Why should they buy it? Your page should answer every single why question you can ask. Read your page over, ask the why question where you can, and then answer them all. A common mistake is creating a wall of text that is not something that is easy to skim. This article is broken up into several subheadings that are easy to scan and understand. If you just hit someone with a wall of text, like a magazine article, you’ll lose them before you get to your call to action. Make defined sections to your landing page and allow readers that skim to get the point of the page easily. Unsurprisingly, spelling errors are annoying. Spelling and grammar can make a page hard to read. If a page is hard to read, no one will stick around and struggle through it. Poor spelling and grammar will chase the majority of people away. Don’t rely on spell check. It only looks for misspelled words. It won’t find words that you didn’t intend to be there that are spelled correctly. Like a “there” that becomes a “here”, or a “this” that becomes a “his”. The majority of people read a headline, but most skip the actual copy. If your headline isn’t very good, you can kiss the rest of the article goodbye. Be clear and interesting. Let them know what they’ll find on your page, and how it benefits them. Draw the reader in right from the headline. If your headline misses the mark, so will your conversions. 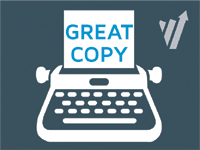 Poor copywriting can explain the vast majority of poor converting pages. If you can clean up your copy, or find a good writer to do it for you, you can increase your conversions almost instantly. At the very least, get a solid writer to review your page. They’ll let you know if it’s off the mark. Norman Arvidsson is an independent author. He is familiar with such areas as startups, small business, and marketing. His goal is sharing his experience with others through blogging. Considers personal and professional growth as the main goals in his life.